Game of Thrones, a Microgaming slot based on the popular HBO series of the same name, comes with plenty of bonus features. The game can be played in two ways—15 paylines and 243 ways to win. Playing Game of Thrones is as simple as placing a bet, spinning the reels, and collecting payouts if a winning combination appears on the reels. 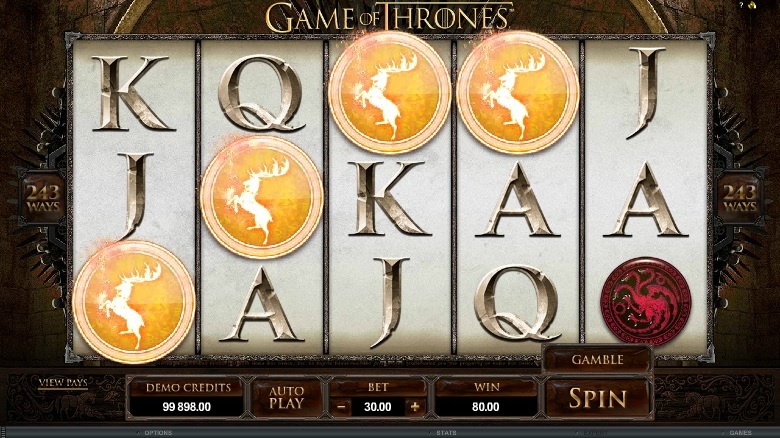 Microgaming’s Game of Thrones slot was developed in honor of the popular TV series of the same name. The slot as well as the TV series is inspired by George R. R. Martin’s books. The TV show won several nominations and awards, making it one of the most popular series in the world. The slot reels feature graphics and symbols that are lifted directly from the TV series to give players the authentic TV show experience. A few high-value card symbols are also scattered on the reels. The most attractive feature of this slot is its four free spin rounds. Players can activate them by landing at least three Game of Throne Logo scatter symbols. Each free spin round is associated with unique multiplier values, stacked symbols, and free spins. The Baratheon House round includes 8 free games, a multiplier value of x5, and Baratheon Sigil icons that appear in stacks of three. The Lannister House round includes 10 free games with a multiplier value of x4 and House Lannister symbols that appear in stacks of four. The Stark House round includes 14 free games with a multiplier value of x3 and House Stark icons that appear in stacks of five. The Targaryen House round includes 18 free spins, a multiplier value of x2, and House Targaryen Sigil icons that appear in stacks of six. Each free spins round can be re-activated while playing a free game and players can win up to 20,250 coins in the Baratheon House round alone. If players land only two Game of Thrones Logo symbols on the reels, the free spins round will not be activated. But this need not disappoint players as the Scatter Bonus Game gets triggered. A brilliant dragon’s egg carrying an attractive cash prize for players appears on the screen, and players just have to click on the egg to claim their prizes. The slot also includes a four-level Gamble Trail game, which includes authentic clips from the HBO series. Players stand the chance of doubling their winnings up to four times. With its attractive free spins round, scatter bonus game, and gamble feature, Game of Thrones challenges players to win up to 121,000 coins, owing to which Microgaming enthusiasts should not miss it.